In a 2 ltr pressure cooker, add all the ingredients given under the heading ‘for dough’ except ragi flour and cook for a whistle. Carefully remove the pressure, add ragi flour and give a quick mix. Cover and keep aside for 20 minutes. In a pan, add oil. Add onion, garlic and saute for minute on high heat. Add cabbage and carrots and toss on high heat so that they become little soft but remain crunchy. Turn off the heat and add soy sauce, chilli sauce, vinegar, black pepper, salt and mix well. Keep aside. Open the cooker, knead the dough by applying little oil on your palm. Divide in small balls. 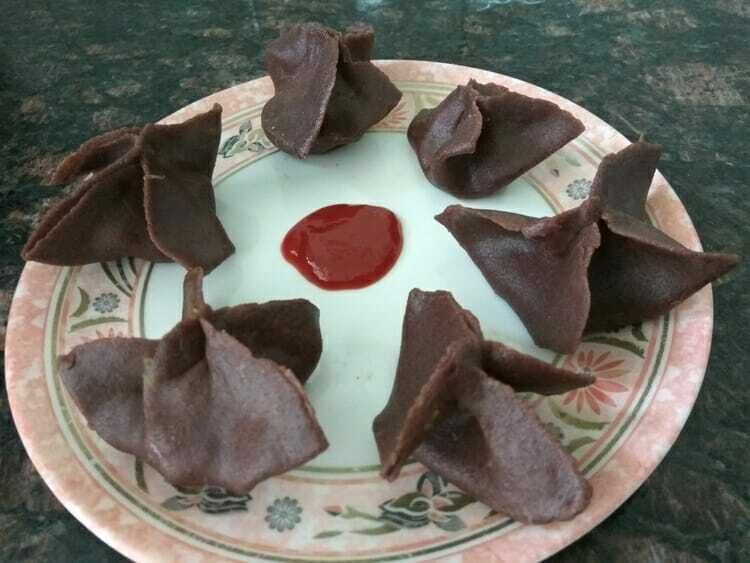 You can either make the momos like kozhakattai/modhakam choppu or roll into small puris. Place a tbsp of the stuffing in the centre and gather the edges giving a nice shape. The butterfly shape is the easiest one with millets as they are gluten free. Steam them for 5 minutes and serve with chilli sauce. 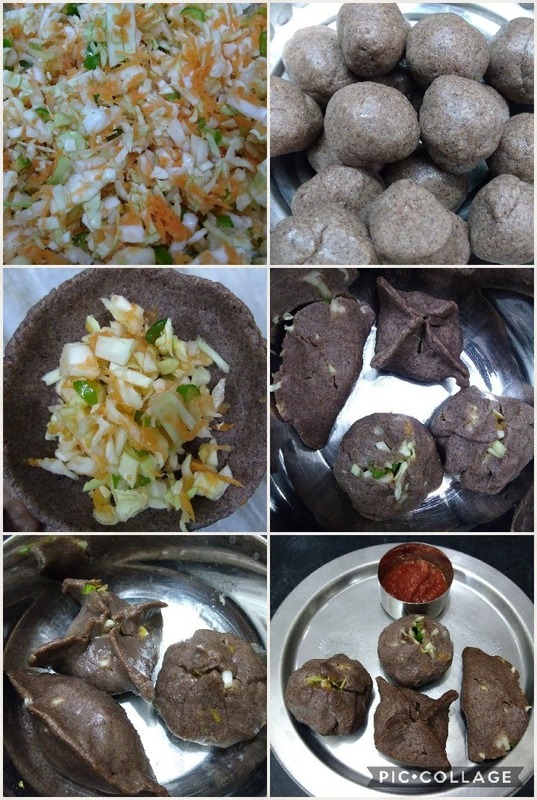 I had such a hatred towards ragi but this recipe was one of the first I tried, and it converted me into a ragi lover. They came out perfect, and despite the fact that I was cooking with ragi for the first time that day, the covering was perfect too. Thank you for such an amazing recipe. Ravi is rich in calcium and fibre. Thanks for the SBS!! 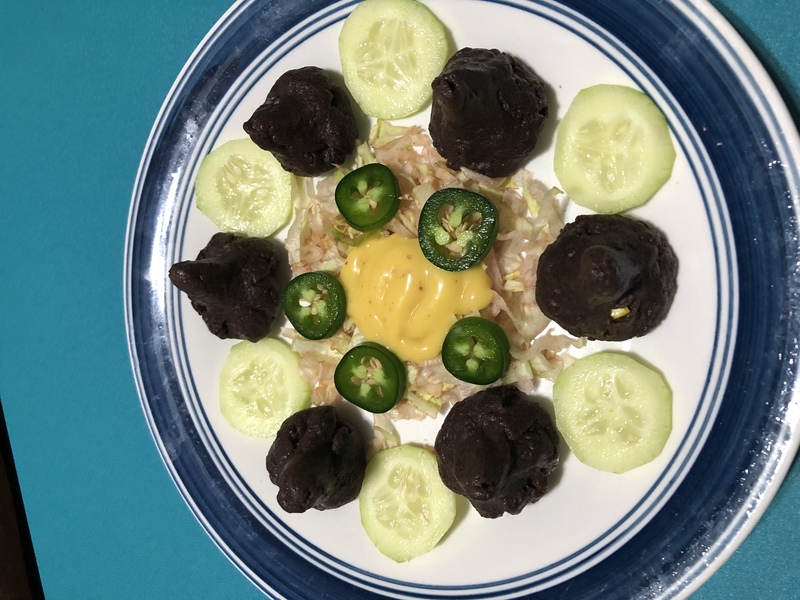 Your momos look perfect!! I am extremely happy to see people eating healthy stuffs. Thanks for sharing your experience. Glad that it came out well. Yes, you can pressure bake the veggies! I didn’t mention it here because many who visit the site are not aware of this technique. I didn’t want to confuse them. That’s why mentioned the traditional method. Those who are aware of OPOS techniques, will do only pressure baking. Thanks for your visit. Thank you. Yea Thot of flash but just wanted to check with you for other reasons if any to maintain authentic recipe. Tried this recipe , came out very perfect and awful healthy recipe.. I am thinking to add this to my meal plan every week and it is very easy to do with opos flashed veggies… Thank you very much VV.. Happy to see your momos!! They are very inviting!! Glad to know that you enjoyed them preparing as well as eting!! Thanks so much for your validation.